The nose took time to develop – eventually producing sharp zesty fruits, grated orange peel, vanilla, caramel, hint of mint and polished or waxed furniture. The palate was more immediately defined – the sweetness of Danish pastries (with vanilla cream and apricot jam) and the perfumed astringency of lime sorbet, starfruit and grapefruit; pepper and chilli arriving in the finish. In reduction, the nose expanded to include papaya, strawberry split ice-lollies, toffee, magic tree vanilla and yankee candles. The reduced palate delivered rich, perfumed sweetness (‘biting a woman’s neck’ someone suggested); oak sharpened the after-taste. The distillery was a brewery until 1843. Appearance: Light honey and not too leggy. Aroma: Buttered toffee, astringent, sulfur and lemons. Taste: A little thin but really well balanced with the sweet and pepper notes combining to a slightly hot, long lasting finish. Despite the fact that this cask strength, I drank most of it without any water and it was fantastic. For the purpose of the tasting I added a little water and found that the nose was significantly reduced (mostly just honey and candy fruits – lemon and orange slices). The taste finds a little less sweetness and a little more spice while the hot finish is also reduced. According to whiskyportal.com (although I didn’t really need to look it up), Cask No. 125.51 is from the Glenmorangie distillery. I would put the Cask No. 125.51 right up there with other expressions from the SMWS; probably a notch or two below Cask No. 125.23 “Murray Mints and Fairy Cakes” and notch above Cask No. 125.48 “Old-fashioned tea chests and maple candy“. Distinctly floral to start – jasmine, lilac – with earthy, ‘mushroom grow-bag’ notes behind. We were reminded of a wild garden, but the heavy scents balanced by emerging lemon sherbets – and this citric note also modifies the sweet taste, with traces of paprika. Fresher and more Speyside-like with water, but still earthy, with a whiff of smouldering leaves, and a fresh note of ‘lemon-scented fabric-softener’. The taste is soft, sweet and quaffable; rounded and centre-palate – ‘mashed strawberries with black pepper’- with a medium length finish. This remote distillery overlooks the Haughs of Cromdale, where once a battle was fought, and its make is not currently bottled by its owner. Appearance: Golden honey with good legs. Aroma: Rubbing alcohol, wet straw, horse blankets and honeysuckle. Taste: Strong; maybe not strong but anesthetizing. Very earthy, with a touch of industrial solvents and nice warming heat at the finish. While siginificantly less alcohol than the Glenmorangie, “In a wild garden, late summer” needed water to cut through the medicinal quality of the tongue-numbing experience. With water, the whisky becomes a good bit softer with an increase in the honeysuckle and other floral notes (maybe a little mint and a little heather). The spice is still retained but moves from solvents to more of Listerine quality and, even with water, there is still a nice, warming finish. According to whiskyportal.com, Cask No. 48.26 is from Balmenach, a distillery founded in 1824 in the village of Cromdale on the banks of the River Spey. I have had two other SMWS bottles from Balmenach. I would say that “In a wild garden, late summer” lacks the polish of Cask No. 48.17 “Tennis court zing and tang”, which was spicy but refined. And, it lacks the overall sweetness of Cask No. 48.20 “Crepe Suzette”. There wasn’t anything inherently wrong with this sample, it just wasn’t in my wheelhouse and it didn’t really represent the qualities of other offerings from the distillery. 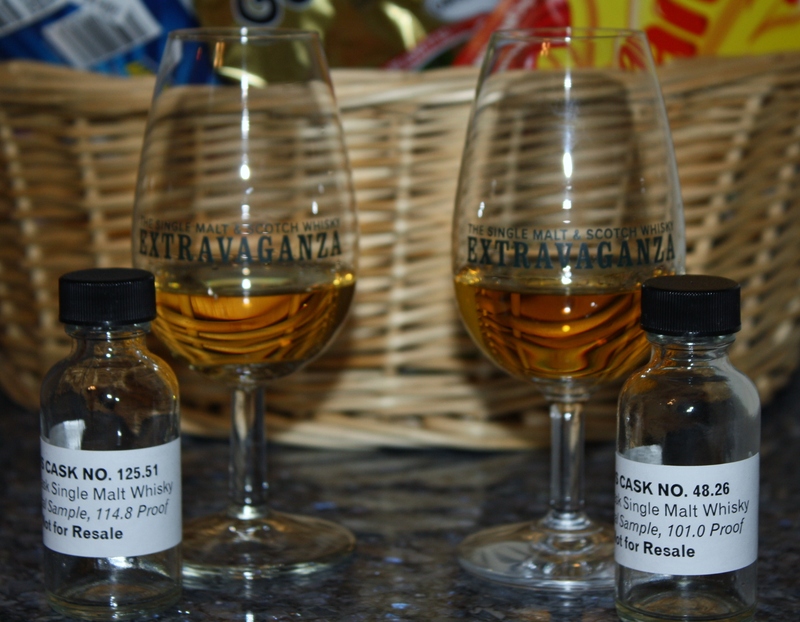 Thanks again to Gabby Shayne (click here to meet The Whisky Sisters) of the Scotch Malt Whisky Society of America for sending us this sample. Fortunately I have a clean copy of the Archemedes Codex, otherwise I wouldn’t have a clue what to do with the math in your post. What is it with distillers and their affection with scientific notation? And why are you calling Suzette a creep? Seems a bit forward. I think the scientific notation is meant to elevate the moonshining operations to some sort of high tech, Nobelesque achievement. And, if you met Suzette, you would understand.